Pakhar, the 14th typhoon of the year, landed around 9am Sunday in the city of Taishan, southern China's Guangdong Province, bringing gales of up to 33 meters per second. People walk against strong wind and rain in Shenzhen, south China's Guangdong Province, Aug. 27, 2017. Pakhar, the 14th typhoon this year, landed around 9am Sunday in the city of Taishan in Guangdong, bringing gales of up to 33 meters per second. Pakhar, the 14th typhoon of the year, landed around 9 a.m. Sunday in the city of Taishan, southern China's Guangdong Province, bringing gales of up to 33 meters per second. Pakhar hit the province soon after Typhoon Hato, which landed Wednesday in Zhuhai, some 80 km away from Taishan. 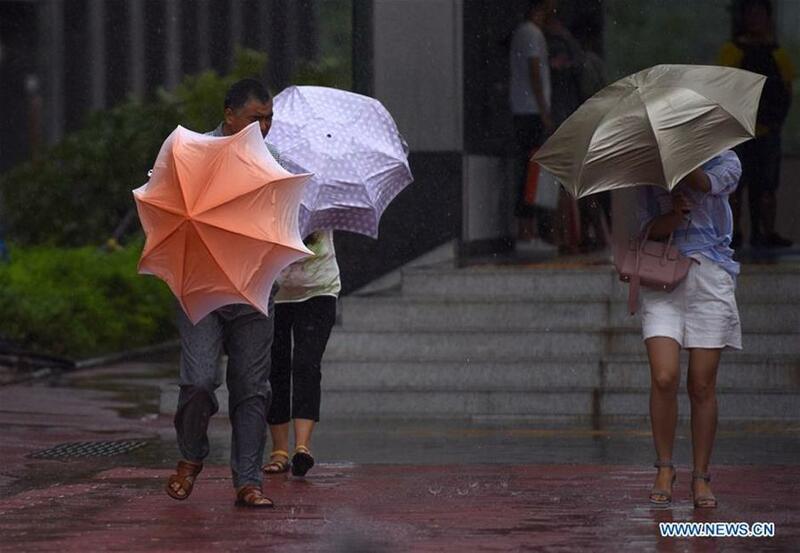 The meteorological center of Zhuhai said the city would see rainstorms and fierce winds Sunday. A temporary closing of local companies, government agencies, schools and public places started Saturday. China's National Meteorological Center (NMC) said that Pakhar would move northwestward, entering Guangxi Zhuang Autonomous Region on Sunday evening while losing strength. Hainan local maritime authorities suspended the service of roll-on/roll-off passenger ships and cross-sea trains running in and out of the province. A total of 24,124 fishing boats have been put into harbor. Ma Jianhua, official with the Yangtze River flood control headquarters, said Hato had brought about the obvious rising of water levels in the Yangtze. The headquarters has dispatched personnel to Sichuan and Yunnan to aid flood control. In Yunnan Province, two more people have been found dead in disasters triggered by Hato, bringing the death toll in the province to five. Six people went missing after houses collapsed in a flood caused by heavy rain on Friday in Yanjin county. Rescuers found two bodies in the debris on Saturday and Sunday respectively.